no big dill: 3 Things. 3 Things on my mind this day. Well, actually more than 3, but I'm pretty sure I'd bore you with everything on my mind, so we'll stick with just 3. ➊ After spending days tallying the votes to name my serger....just kidding. It's just that life takes over and I don't get to things as soon as I'd like sometimes :). It was a clear and large majority that voted for Sergei! Yes, my serger is masculine. He can handle those big, fat, multi-layer seams without whining. He muscles his way through, tidying the stray, unraveling edges. Thank you for playing along and casting your vote. Ryan asked why I was naming my serger. 'Cause it's fun. ➋ Thank you also for your thoughts on my previous post. I love it when others have been pondering over the same things, sometimes all over the world, and that we can have a dialogue and share thoughts. So, thank you for sharing yours. ➌ I have been eating up all the 2-year-old cuteness that you've been sharing! 2-year-olds really are the best, aren't they? I've loved reading all your favorite characteristics of those cute twos. There is still time to enter the cLOVEr 2 Jumper giveaway, and I wish I could clone myself and make every single one of you a jumper, and have them roaming/jumping/skipping/twirling on 2-year-olds all over the place. ➍ Tricked you! I have one more thing to share. Chapter 3 of Once Upon a Thread is coming up soon! May 21st to be exact. I hear my sewing machine calling. Yes, Gladys, I'll be right there! I don't think I'm going to be able to whip out all the projects that are floating around in my mind, but we'll see. It will run for three weeks, so get ready to add your own sewing to the flickr group. No limit of the number of projects, but only 2 photos for each project, please. You can include a link to your blog if you have a million more photos of your amazing project you want to share. Can't wait! Oh,so excited! I love Once Upon a Thread! So excited for Once Upon a Thread! 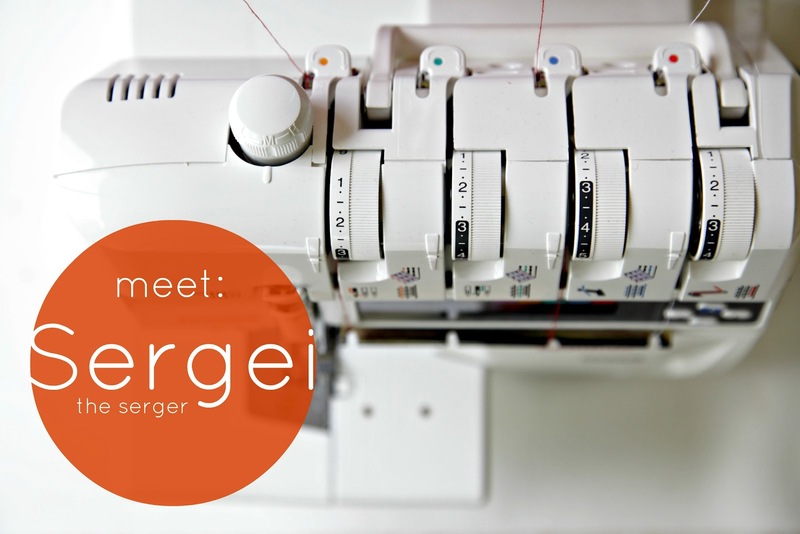 And, I hope this doesn't come out wrong - but I think those qualities you mentioned about your serger can be just as feminine as masculine - handling hard work without whining, muscling through, tidying up stray edges... ;) But Sergei is a great name. Thanks for sharing inspiration with me through your blog. Hooray for Once Upon a Thread! It's my favorite!